English translation of Tenerife place names. English Translation of Tenerife place names - you'll be surprised! Yes, the English translation of "Los Abrigos" is "The Overcoats"! Why the small fishing village up near the urbanizations of Golf del Sur and Amarilla Golf should be named after an item of winter clothing is a mystery. Another, seemingly random, name for a village is "Las Galletas" - "The Biscuits". Situated on the Costa del Silencio, it wouldn't be so bad if it was a major centre for the manufacture of that particular edible treat...but it isn't. Again, no-one knows why. While we're on the subject of Costa del Silencio, rather obviously having the English translation "Coast of Silence", who thought to give that name to an area right near a busy airport? Hmm. 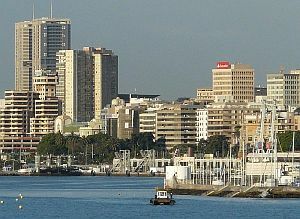 Then we have Puerto de la Cruz - "Port of the Cross". At one time, it was known as "Crossport", which makes it sound like a neighbour of Blackpool. 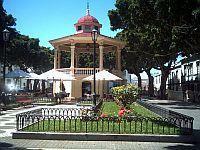 It has a main square, rather romantically titled Plaza del Charco. It too would fit a holiday resort in the north of England, because the English translation is "Place of the Puddle" (honestly). Some English translations are quite obvious, such as La Laguna, which means "The Lagoon" and El Rosario - "The Rosary" (more evidence that you're in a Catholic country). Still in that vein, but a tad less obvious, is Candelaria - "Candlemas". Others, you'll never guess. Granadilla is "Passion Fruit"(! ), El Medano is "The Sand Dune", Vilaflor is named the "Village of Flowers", while El Sauzal is "The Willow Tree". Los Silos - so where are the silos? Villages could be named summarily after, well, objects that were found in the area. Because a community involved in cereal production had to build silos nearby, the village became Los Silos. Another place was graced with an irrigation tank (ah, the romance!) and was christened El Tanque. So, a coastal town has a beach, with sand. It is therefore named Playa de la Arena - "Beach of the Sand" (yes, 'arena' doesn't actually mean arena in English). Fair enough. Yet, when there's a "beach" that's actually a load of rocks, it is still named Las Arenas - "The Sands"! That's a bit cheeky, I feel. Some names just tell it like it is. If the place has a Good View of the North, why not call it that - "Buenavista del Norte"? Los Gigantes, "The Giants", refers to the town's huge, towering cliffs that drop abruptly down to the sea. Some place names commemorate visitors to the island, whether hostile or benign. Los Cristianos is "The Christians", after missionaries who landed and tried to convert the natives. Los Realejos is in honour of "The Royalists" and dates from the Spanish conquest. Various battles are reflected in La Victoria - "The Victory" and La Matanza - "The Slaughter" (charming name for a town). Going even further back in time, some of the more unusual names derive from the language of Tenerife's original inhabitants, the Guanches. 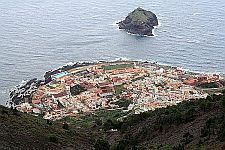 Garachico is half Guanche, with their word "igara" - island - and the Spanish "chico", meaning small (and not that singer who didn't win "X Factor"). Other names are pure Guanche: Adeje, Guimar, Tacoronte and Tegueste. Which brings us to the name of the island itself. 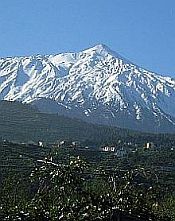 It derives from the language of the inhabitants of the neighbouring island of La Palma ("The Palm"). "Tene" meant "mountain" and "ife" was "white". The Spanish came along and added the "r" in the middle. The actual name used by Tenerife's original inhabitants was "Chinech". ***If you're wondering why Playa de las Americas isn't included here, it is a purpose-built holiday resort, dating from the 1960s and, therefore, has no particular history in this regard. Its name means "Beach of the Americas".